If your favorite color is yellow, then xanthic might be the word for you! Xanthic can describe just about anything which either is yellow or is somehow related to yellow. If, for example, you were trying to decorously describe some soiled bedsheets, you might remark: "Hmm, little Billy's sheets seem to have some areas of xanthic discoloration." This statement would, unfortunately, mean that Billy's sheets have some yellow stains. Xanthic can be used in much more beautiful and much more subtle ways, however. It is often used in reference to flowers in particular. 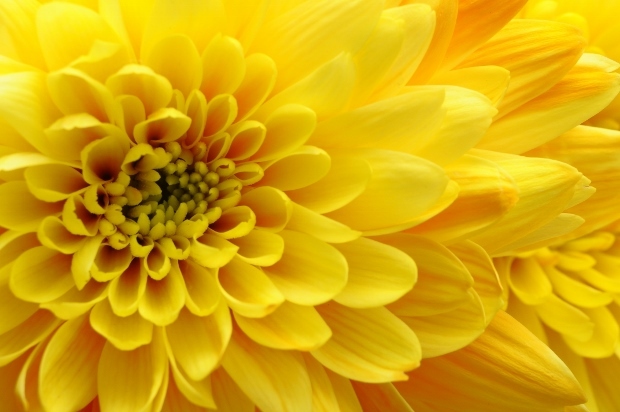 A xanthic flower can be a brilliant yellow, like a sunflower, or it can merely possess a slight yellowish hue. In fact, the latter usage of xanthic is the more common in general. If something is obviously yellow, then most of the time you will probably want to simply describe it as yellow. However, if something's color is somewhat vague, like a very pale flower or some stained wallpaper, then you might use xanthic to communicate a sense of "general yellowishness." In addition, something xanthic could be some other color with a yellowish undertone. For example, a white tablecloth might fade and grow xanthic over time. Xanthic can describe a pretty broad range of visual phenomena, so whether you're gagging over a puddle left by your pet or gasping before a brilliant sunrise, xanthic might be the adjective you need. Example: Much to the distress of all of us, the wall which we had tried to paint brown had an undeniably xanthic hue. Example: Although Augustus praised everything from her roseate lips to her xanthic hair, Clarice remained unmoved by his passionate vocabulary. Xanthic derives from the French xanthique, which means "of a yellowish color." That French term in turn derives from the Greek xanthos, meaning "yellow." Xanthic entered English in the early 1800's with its present meaning. Xanthine(s) or Xanthin(s): This noun form is a term in Biochemistry referring to a certain crystalline compound which performs important functions in many organisms. Example: Xanthine performs an important role in the human body, aiding in the breakdown of nucleic acids into uric acid. The berimed tree and the high snow drift with its xanthic hole have been removed by a silent property man. Here, Nabokov uses xanthic to describe a yellowish stained area on a snow bank. The word xanthic might be most familiar to some through xanthic acids, a class of (usually yellowish) organosulfur compounds which includes all of the esters of the salt ROC(S)SH. Bring out the linguist in you! What is your own interpretation of xanthic. Did you use xanthic in a game? Provide an example sentence or a literary quote.